ANNA MARIA ISLAND, A Tour Through Paradise. New souvenir book. If you love AMI, you’ll love this book. Sold at many Island locations or call Gene, 941-705-2757. KAYAK SEATS: TWO, both $40, Oais pond vacuum, $35. 941-518-1216. FREE 52-INCH WHITE Hunter fan. Four blades. Runs great! Zan Fuller, 813-503-9364. TWO PURSES WITH wallets to match, Vera Bradley and Spartina Good condition, $50, all four pieces. 941-345-4464. WHITE WICKER chairs, one large, one small, $45 each, HP printer/scanner/fax/copier, 7250, ink, $85. 616-634-6633. FULL BED: AMERICAN Signature, new, box and mattress, matching stand and mirror, $250. Dryer, $50. 941-704-7798. ENGLISH PUB TABLE: 36-inch square plus two leaves, four chairs, $250. 941-778-0856. SIX OAK OFFICE chairs: Antiques, perfect for eclectic dining set. 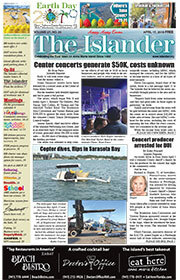 The Islander newspaper, 3218 East Bay Drive, Holmes Beach. DUNBY’S RESTAURANT NOW open: Belgian cuisine and Belgian chocolate desserts, made to order for your party. info@dunbys.com. www.dunbys.com. WANTED: WORKOUT DVDs and retired but working XBox, Wii units with games for Ministry of Presence for kids and teens in Haiti. Deliver to The Islander, 3218 East Bay Drive, Holmes Beach. FREE GUN LOCK courtesy of Project Childsafe, Florida Fish and Wildlife Conservation Commission and Holmes Beach Police Department. Pick up at The Islander office, 3218 East Bay Drive, Holmes Beach. Don’t be sorry, be safe. ROSER THRIFT SHOP: Open 9:30 a.m.-2 p.m. Tuesday and Thursday and 10 a.m.-1 p.m. Saturdays. Annex open same days until noon. Donations accepted 9-11 a.m. Wednesdays. 511 Pine Ave., Anna Maria. 941-779-2733. SALE: 8 a.m.-? Saturday, Nov. 1. 39-inch china hutch/cabinet, cherry entertainment chest, accessory tables, lamps, framed art, Canon copier, pet stairs, miscellaneous household items. 8675 46th Ave. Circle W., Bradenton. YARD SALE: 8 a.m.-2 p.m. Saturday and Sunday, Nov. 14-15. Great treasures to find! 117 Palmetto Ave., Anna Maria. FOUND: HOLMES BEACH. Prescription eyeglasses with sunglasses attached. Claim at The Islander office, 3218 E. Bay Drive, Holmes Beach. FOUND: PRESCRIPTION GLASSES. Found on the beach, 36th Street area. 941-778-4754. LOST CAT: HOLMES Beach. Orange male, 16 years old. Collar, microchipped. If found, 941-518-6329. FOSTER HOMES NEEDED! Please, call Moonracer Rescue for information, 941-896-6701. www.moonraceranimalrescue.com. 1975 CUTLASS SUPREME, 80,000 original miles, asking $2,500. Call 801-833-8146. BOAT SLIP FOR sale: Holmes Beach. Contact amierma@yahoo.com. LOCAL ANNA MARIA Island jewelry store looking for sales person. Must enjoy talking to people and have a neat appearance. Call 717-977-1818. U FLY I drive your car anywhere in the USA. Airport runs, anywhere. 941-447-6389, 941-545-6688. PHOTOGRAPHER: FAMILY, PET, reunion, tourist beach photos! Debra Peck Photography, 770-880-6295. MOLD GONE GUARANTEED: 3-5 year guarantee. Call soon and schedule a free assessment from Jesse at UCS/LLC, 703- 975-8274 or email me at wdjes@aol.com. PET SITTING AND dog walking services. Call Patty for the lowest rates in town! 517-281-6087. PROFESSIONAL PRESSURE CLEANING of home, driveway and pavers. The Flying Dutchman LLC. Bonded and insured. 941-447-6747. SUN MAINTENANCE & Service: Full lawn care services. Pool service, landscaping and design, cleanup, removal, trimming of trees palms, shrubs, etc., even free snow removal. Call Travis, 941-779-8389. NATURE’S DESIGN LANDSCAPING. Design and installation. Tropical landscape specialist. Residential and commercial. 30 years experience. 941-448-6336, 941-729-9381. SEASONAL VILLA: PERICO Bay. 2BR/2BA, sleeps six, near beach, pool. Clubhouse, tennis, lake view. January-March. 941-792-0568. BEAUTIFUL BEACHFRONT CONDO: 2BR/2BA large heated pool, tennis, elevator. Available Jan. 10-March 31. Holmes Beach. Call 858-345-7160. HOLMES BEACH WESTBAY Cove condo: Second floor with views of bay and lush landscaping. 2BR/2BA with large lanai and laundry room, two heated pools, tennis courts and one block to Gulf beach. Available November through March. $3,200/month, 30-day minimum. terryaposporos@gmail.com, 941-778-8456. FOR RENT: BRADENTON Beach 2BR/1BA. One-two adults, nonsmoker, annual. $900/month, water and trash included. One-car parking. First, last plus security, $500. 941-778-2471, 941-361-1788. GULF DUPLEX: TWO bedroom side, all new granite kitchen, tile bath, impact windows, tile floors. One bedroom, ready to finish ($10,000-$15,000). 5,000-plus foot lot. $435,000 or completed $495,000. 508-496-8480. BEAUTIFUL LOT AT 1107 Palma Sola Blvd., Bradenton. Ready to build your dream home. For more information, call Gregg Bayer, AMI Beaches Real Estate. 941-567-5234.